For us to get what we want we first have to KNOW what we want. Take time to ensure you know exactly what you want and how you know when you will have it. Understanding for what purpose you require it too is a good check to how important it is. The more control you have of your well-formed outcome the more chance you have of achieving it. On the other side though, if it is 99% impossible it is still 100% possible just by implementing the rest. The better you get at sensory acuity the understanding you will have of self and others. 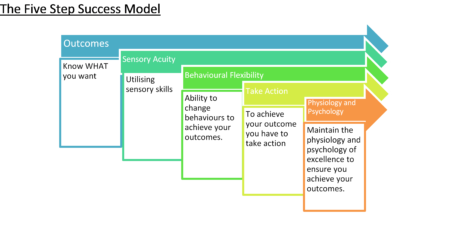 Sensory acuity helps you to identify where, how and what to give your attention to. It is the non-verbal language that has the most influence and observing the signs aids communication and interpretation and therefore much more awareness. If something remains rigid and inflexible it is hard to move and sometimes easier to break. A person with great flexibility has much more ability to change and respond to events, feedback and therefore has a much greater chance of doing, learning and having more. Flexibility enables increased options for success. Well that is self-explanatory. Action is a crucial element to adapting, transformation and success. Remember by focussing on the steps the size of the task can be greatly diminished. One step at a time can keep you on track. Ask any top athlete and they will tell you to be a winner you have to know you can do. Part of that knowing is to adopt the winning attitude and to behave like a winner. It is a proven fact that if a person stands straight and tall, with their head held high they will appear more confident on the outside and quite often they experience an internal change as well and feel more confident. Athletes, top business people, anyone who succeeds starts with the belief and behaviour of success. To have excellence we must take on the role of excellence.